In preparation for the writing of this chapter, a JPPI fellow had his DNA tested through Family Tree DNA in order to better understand the type of information provided to consumers. Specifically, JPPI purchased three different tests: The first test called the Family Finder is an Autosomal DNA test, which examines parts of one’s DNA that could have been transmitted by any ancestor. Although this test is the broadest in that it provides general information about the mixture of all ancestors and allows individuals to find cousins within the past five generations, it doesn’t provide specific information about one’s direct paternal or maternal linages. The third DNA test performed focused only on the Y-Chromosome which is passed exclusively from father to son (women do not have a Y-Chromosome) and therefore carries information on one’s direct paternal linage. The specific test ordered, Y-DNA37, analyzes 37 genetic markers and can predict relationships within the past eight generations.28 These three tests cost around $320 USD in total, but each test can be purchased separately. Once ordered through the company’s website the DNA test kit arrives by mail. The kit contains two cotton mouth-swabs and two tiny plastic vials to put the cotton swabs into after the tester scrapes the inside of his or her cheek. The tester then mails the samples back to the company and waits several weeks for the results to become available online. The results JPPI received from the DNA tests demonstrated the extent to which the tests could influence one’s perceived identity and ethnic affiliation. Figure 1 below shows the “Ethnic Makeup” based on the results of the “Family Finder” test, which analyzed autosomal DNA. 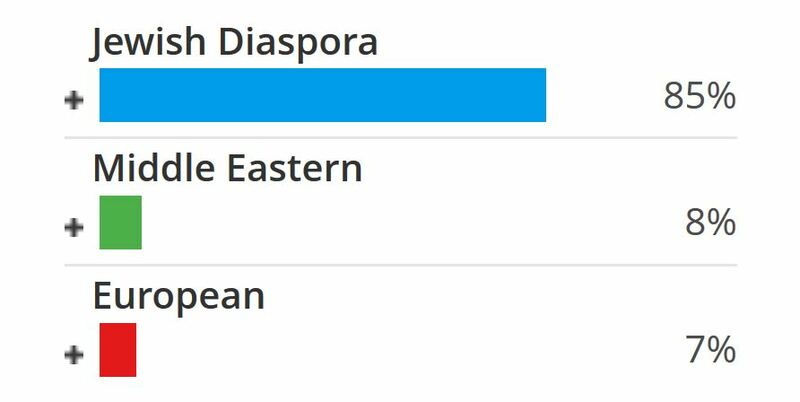 According to the test, “Jewish Diaspora” makes up the largest percentage of ancestral origins. That is to say, when comparing the autosomal DNA of the test taker to various reference population groups included in the company’s database, the sample resembles most closely that of Ashkenazim. Geographically, the focal point of ancestral “origins” is the area formerly known as the Pale of Settlement. The results also indicate that some of the ancestors of the test taker may have been of Middle Eastern and European origin. According to Bennet Greenspan of Family Tree DNA, the presence of European and Middle Eastern ancestors can be explained by the observation that Ashkenazim have a combination of paternal Middle Eastern ancestry and European maternal ancestry. It should be noted that all four of the test taker’s grandparents were born in Canada and all his great grandparents were born in Europe. Another aspect of the results the autosomal DNA test generated is the “Family Finder” which matches the tester’s DNA with other customers who are possible relatives.29 The company states that it can match second cousins with 99% accuracy, third cousins at 90%, and fourth cousins at 50%. In this particular case, the test identified hundreds of possible relatives, but the JPPI fellow was only able to verify that three of the matches were indeed relatives (a second cousin once removed, a second cousin twice removed, and a third cousin once removed). 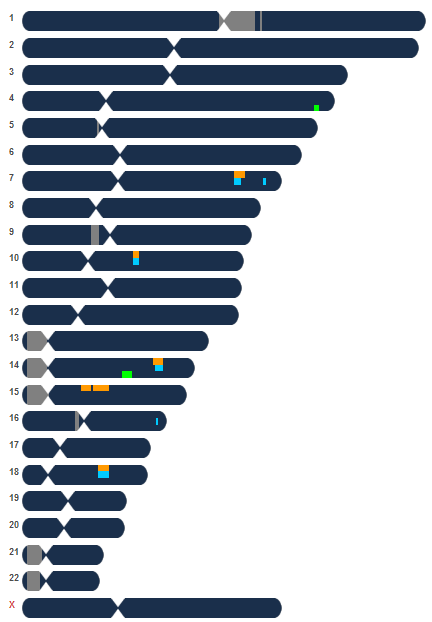 Figure 2 is a visual representation produced by FTDNA of the tester’s DNA sample, divided into the 23 chromosome pairs. The tester’s DNA is being compared with the DNA samples of three specifically selected individuals, two known blood relatives (father and daughter) the FTDNA was able to match and one individual that FTNDA identified as a possible distant cousin, but which could not be verified by the tester. The areas where the color blocks appear over the blue are the parts in the DNA sample that are identical. The larger the overlap, the longer the matching sequence. The results of the mtDNA test, which carries information on the direct maternal linage exclusively, also suggested Jewish heritage. Specifically, among the 100 people in the database who match with the tester’s mtDNA, roughly 50% are identified as “Ashkenazi,” 2% as “Alsace,” and the rest are not specifically defined beyond maternal country of origin. While it is most likely that the test-taker’s direct maternal ancestor was Ashkenazi, it is also possible that this ancestor was Alsace and not Jewish at all. The tests results of the Y-DNA, which deal exclusively with the direct paternal linage, also suggested Jewish ancestry. Among the individuals whose sample identified as a “genetic match,” 65% self-identified as some variant of Ashkenazi or Sephardi. Similar to the mtDNA results, no other ethnic or religious description was provided among all those individuals who were genetic matches. That is to say, of the roughly 35% genetic matches that did not define themselves as Sephardi or Ashkenazi, no alternative identity was provided. According to the test results, it is most likely that the direct paternal ancestor had Jewish ancestry, but it also means there is a 35% chance that the ancestor was not Jewish. Interestingly, the results of these DNA tests are congruent with the studies conducted by Behar et al. (2010) and Costa et al. (2013), which examine the origins of the Jewish people through DNA analysis. Specifically, the tester’s maternal linage suggests a prehistoric European ancestry, while the paternal linage suggests Middle Eastern origins during the corresponding era. The test results shared above are from tests that can be purchased separately. For some individuals interested in DNA tests for genealogical purposes, but on a limited budget, purchasing only one type of test could lead to misleading or incomplete results. For example, neither the Y-DNA test or mtDNA test described above gave results that specifically refer to any Middle Eastern origins, while the results of the autosomal DNA test did. Also, as the technology of DNA tests continues to advance and a larger database of DNA samples is available for comparison, the amount of information generated will be of a much higher resolution than available today. Therefore, individuals should not draw too many conclusions about their ancestral origins from a single DNA test or even expect to have a complete understanding of their genealogy from several tests. Moreover, the tests are probabilistic, meaning there is an element of chance involved that could lead to results based on mere coincidence.